WinZip 17 meets today's organisation needs with an easy and secure file compression tool that improves productivity and ensures safe data delivery. WinZip allows users to compress large or small amount of files, saves space on desktops and servers and now includes support for the Cloud. Deter unauthorised copying and protect photos and files by adding custom watermarks to images and PDFs. Resize images to more convenient sharing sizes without complex image editing software. WinZip now offers support for secure cloud environment and social media so users can send files risk free. WinZip 17 saves users time with its one click Winzip wizard, full file and folder compressions and encryption of archived data to help keep it safe and retrievable. Easily email larger files with automatic zipping and let ZipSend send oversized files. Protect documents with new PDF conversion, watermarking, AES encryption and more. 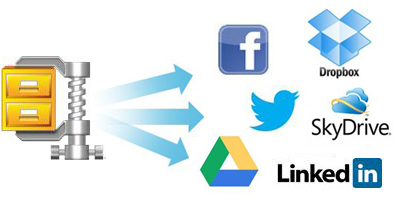 Zip and share to the cloud for secure online sharing and social media. Get more value with the power of several tools in one for zipping/unzipping, encryption, PDF conversion, image compression and watermarking. Ensure your company's information is protected whether it is sent by email or shared online. Minimise storage and bandwidth costs in-house, in transit and in the cloud. Get a multi-platform solution from one vendor. 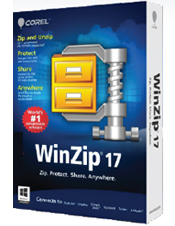 WinZip supports Windows 8, Mac, iOS and Android. Connect to your cloud services, including Google Drive, SkyDrive and Dropbox. Zip before you upload, open zip files saved in the cloud or select files from the cloud to zip and share. Easily get links to your files and share them from your own email. Instantly resize images to more convenient sharing sizes without using complex image editing software. Turn Microsoft Office documents into PDF files as you zip them with WinZip's built-in PDF converter. Deter unauthorised copying, add traceability and protect your photos and files by adding your own custom watermark to images and PDFs. WinZip's compression produces smaller Zip files than the standard Windows Zip Utility, saving your hard drive space and bandwidth. Additionally the new .zipx file format can compress files even further. WinZip integrates into Windows Explorer, providing its powerful functionality within a few clicks. WinZip Professional contains task automation capabilities including automatically uploading to FTP or burning to disk and automatically emailing Zip and log files on WinZip job completion making short work of backing up important data. WinZip includes numerous features to simplify the use of the application including a variety of different user interfaces, the ability to create self extracting .zip files for those without WinZip and Smart View which logically structures the display of files within a .zip. WinZip supports AES (Advanced Encryption Standard) encryption, which is a highly secure encryption algorithm to protect your sensitive data. System Administrators can specify password policies to configure password complexity requirements and if they choose, restrict or deny access to WinZip's encryption functionality for end users. WinZip can compress your photos (including JPEG files) and add them to an archive or directly to an email. Photos can then easily be resized whilst leaving the original pictures unchanged. In addition, the Professional edition can compress files from supported digital cameras directly to a .zip, auto rotate photos and show, rotate, resize or delete photos without having to extract them from the .zip. Command line interface for scripting WinZip functionality (free addon). Advanced photo management functionality – transfer, rotate, resize and view photos directly from a Zip file.